For the health and safety of all our guests, we care exclusively for cats. Any guest over six months old must be spayed or neutered. Nights are spent in private condos. 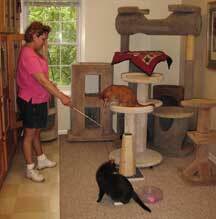 During the day, cats are free to roam about the inn, either alone or with the other kitties. Drop-off and pick-up: We schedule time to care for our guests, keep the inn sparkling clean, and provide lots of love and attention for our guests. Drop-off and pick-up is by appointment, to accommodate your schedule and ours. 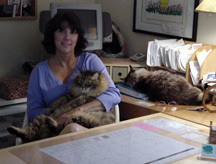 Call 952-470-6339 for a drop-off appointment; or to arrange for us to pick-up your kitty at home. What to bring: Bring your cat's own food. You must provide proof of up-to-date rabies and distemper vaccinations, and feline leukemia negative test results. Owner of outdoor cats must also provide proof of feline leukemia vaccination. Bring your itinerary and phone numbers where you can be reached, as well as emergency numbers of local friends or family. Please use a carrier or leash when arriving and departing, for the safety of your pet. Illness & Fleas: Please do not bring cats who are ill or who have fleas. Cats found to have fleas will be treated, and an additional charge will apply. Emergency veterinary service is available. Reservations: are required. If you need boarding right away, please call to see if space is available. Cancellation policy: If you must cancel a reservation, please give us at least 48 hours notice, as we sometimes have a waiting list. Reservations cancelled with less than 48-hours notice will be charged $25 per cat. Rates: Please call for current short-term, long-term, and multiple-kitty rates.